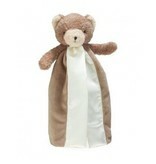 Cuddly bear Cubby comes in mushroom brown and warm cream plush fur. Hand crafted, baby-safe embroidered face and a snuggly soft mushroom brown velour split blanket lined and edged in silky soft cream satin. 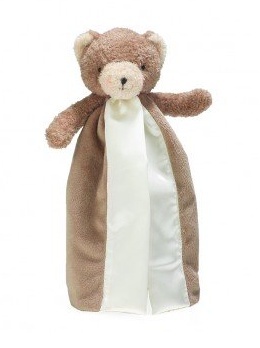 A smaller version of our best loved Buddy Blanket, this Lovey is ready to be on the go. With a handy loop on the back to attach to the car seat, stroller or crib you're sure to never be left without this precious friend again. Signature three carrot tag for little ones fingers. Add a monogram for an even better personalized baby gift. 11" Tall. Machine wash cold, tumble dry low. 100% Polyester. Imported.